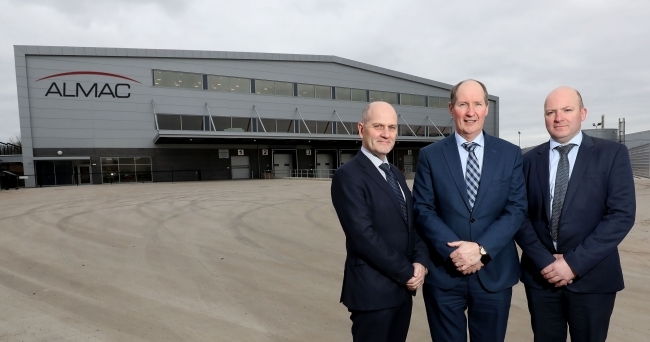 Almac Group, the global contract pharmaceutical development and manufacturing organisation, has announced the completion of a £20 million investment in its cold chain management capabilities with the opening of a 95,000sq ft custom built cold store facility at its global headquarters in Northern Ireland. With over 30 years’ experience in the field of global distribution and management of temperature sensitive drug products, this expansion strengthens Almac’s ability to provide a seamless, best-in-class service to its growing global client base by ensuring efficient and effective delivery of both clinical supplies and commercial drug products. The cold store, which is one of the largest of its kind in Europe, has been purpose built in response to customer requirements which includes consideration to the rapidly growing area of orphan drug products, changes to regulatory compliance and a more stringent focus on data across the supply chain. The additional capacity and tailored design also offer clients the opportunity to scale up with Almac as their biologic/biosimilar product portfolio increases. The new facility complements Almac’s existing global clinical supply and drug product capabilities by boasting over 3,000 pallet spaces including -15°C to -25°C storage capacity, additional 2°C – 8°C secondary production rooms, 3PL processing areas and a custom designed clinical labelling suite. Supplementary office space has also been included to accommodate an additional 100 new employees who will be recruited as a result of the expansion. This news comes just weeks after the company announced a £30 million investment in its new European campus based in Dundalk, Ireland which will ensure the company meets current and future client needs in the EU marketplace. This expansion includes a new QC laboratory, packaging facility for commercial drug products and a dedicated 79,000sq ft EU Distribution Centre for clinical trial supply, all of which is scheduled to be operationally ready by January 2019.